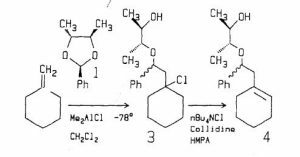 Me2AlCl induced reaction of acetal 1 with methylenecyclohexane at -78°C gives a 61% yield of 3 as a 7:3 mixture of diastereomers. 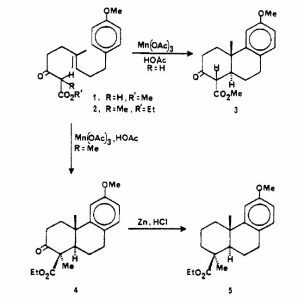 The sequential ene reaction annelation sequence has been shown to be applicable to 2- and 3- substituted methylenecycloalkanes. 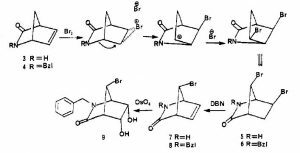 Methyl groups in the 2-position are transformed into angular methyl groups in decalin or indane derivatives. 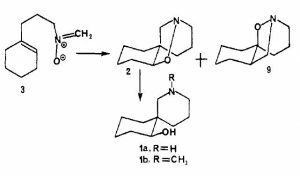 The chloromethylaluminum alkoxides produced in these reactions, i.e., 7 undergo an Oppenauer oxidation in situ in the presence of excess acrolein to give the corresponding ketone in good yield. Using these procedures, indenone 8a has been prepared from 4a in one pot in 60% yield. 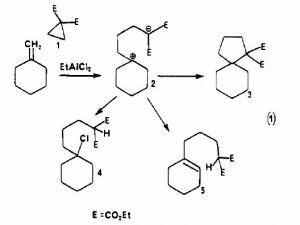 Intermolecular kinetic isotope effects with 2,3-dimethyl-2-butene and methylenecyclohexane and intramolecular isotope effects with gem-, trans-, and cis-2,3-dimethyl-2-butene-d6 establish that the Lewis acid catalyzed ene reactions of methyl propiolate, formaldehyde, and diethyl oxomalonate proceed through a stepwise reaction with rate-determining formation of either (1) a three-membered ring intermediate lacking the geometrical rigidity of perepoxides and related intermediates, (2) a pair of rapidly equilibrating zwitterions, or (3) a π-complex between the ene component and enophile-Lewis acid complex. 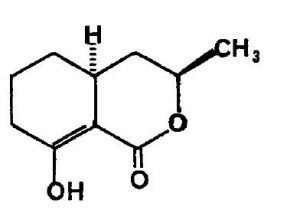 The ketone 1a, which we have prepared from geranylacetone in 38% yield by a four step sequence, has been converted to β-copaene and β-ylangene by a three step sequence. 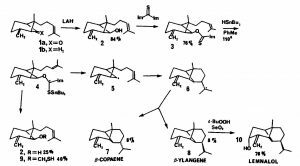 Oxidation of β-ylangene with SeO2 gives lemnalol in 76% yield. 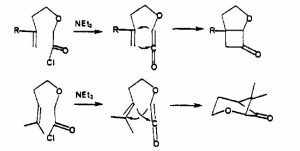 Treatment of α,β-unsaturated acid chlorides 5 and 6 with NEt3 in toluene at reflux generates, stereo- and regiospecifically, the vinylketene which undergoes a facile intramolecular [2 + 2] cycloaddition. 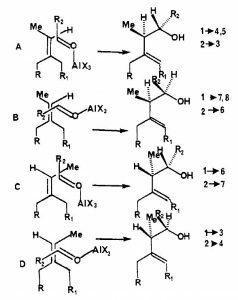 Bromolactonization of 4-hexenoic acids gives a greater percentage of δ-lactones than does iodolactonization. 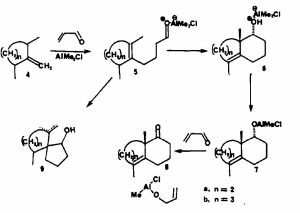 Substituents in the 3-position favor the formation of δ-lactones while substituents in the 6-position favor the formation of γ-lactones. 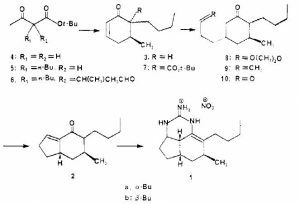 A biomimetic type synthesis of (±)-ramulosin from the acyclic precursor 9 is described. 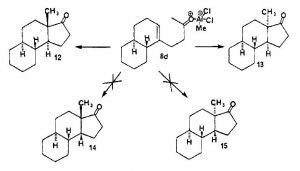 Mercury mediated oxidative cyclization and bromolactonization are shown to be useful for the construction of the actinobolin skeleton. 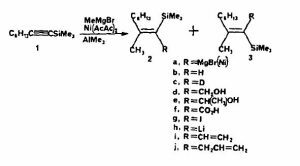 Methylmagnesium bromide adds to trimethylsilyloctyne (1) in the presence of 10 mol% 1:0.67 nickel acetylacetonate-trimethylaluminum to give a 9:1 mixture of alkenyl Grignard reagents 2a and 3a. This mixture reacts with water, deuterium oxide, formaldehyde, acetaldehyde, carbon dioxide, iodine, vinyl bromide or allyl bromide to give the expected products.